We have a minor tradition of doing a climate-related book review in the lead up to the holidays and this year shouldn’t be an exception. So here is a round-up of a number of new books that have crossed our desks, some of which might be interesting to readers here. First off, Kerry Emanuel’s little primer “What we know about climate change” is a reprint of an essay he wrote for Boston Review earlier this year. I reviewed this for Nature Reports Climate Change already, so I won’t repeat myself here except to say that it is a good quick read from a reluctant convert. It might be particularly useful for a stubborn uncle at the holiday family gathering. Gary Braasch is a photographer (and, full disclosure, someone I’m working with on another project), who has become one of the lead documenters of climate issues and whose images have appeared in National Geographic etc. He’s collected his photographs and travel notes into a new book ‘Earth under Fire – How global warming is changing the world‘. The book is very much a narrative of his personal journeys from the Antarctic Peninsula to Alaska and many points in between, documenting the changes he’s witnessed, the scientists he’s met and the people whose lives are already being affected. The science is descriptive rather than detailed (though there is plenty of interesting tidbits), but the real strength of the book is the imagery. As Braasch points out in the introduction capturing, in a snapshot, climate changes that have been underway for decades is a challenge. Photos can have an iconic quality which, although they are not science themselves, can certainly illuminate that science. There is for instance a particular iconic series of retakes of old glacier photos showing the often dramatic changes over the decades. Many of these photos can be seen at his website, but they definitely come out better in the book. 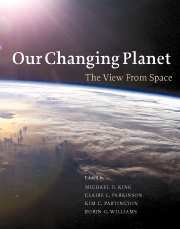 Another book with great pictures – more loosely focussed on all kinds of environmental change – is “Our Changing Planet – The View from Space“, a multi-author introduction to the spectacular vistas now available from remote sensing. These cover visible changes in deforestation, the drying up of Lake Chad, the melting of the Arctic sea ice, mostly seen from 800 km up – the height of the polar orbiting satellites. The text associated with each subject is terse but has enough information for readers to work out what is going on and how any particular technique works. Again, some of the pictures are stunning. (Note despite the similarity in titles, this has nothing to do with the annual reports of the USGCRP which are a much duller read!). Other RC people have recommended Storm World by Chris Mooney on the sometimes fractious, but always interesting, world of hurricane/climate links, and Six Degrees, Mark Lynas’ step by step guide to what each additional degree of warming might bring. “Thin Ice” by Mark Bowen gets a big thumbs up as well. It is more or less a biography of Lonnie Thompson but it is by no means limited to Thompson’s work. Much of the book focuses on various important figures in the history of the science of climate: Arrhenius, Tyndall, and Keeling among them. And while paleoclimatology takes the main stage, one could read this book alone for a very clear lay-persons understanding of the physics of the greenhouse effect, or for insight into the mind of the brilliant and provocative James Hansen, or the story or Roger Revelle and David Keeling’s measurements of carbon dioxide concentrations. It is notable that Bowen has a PhD from MIT, so is no newcomer to science. And finally, something for the kids. But only if your children have been very, very bad should you consider giving them a copy of Holly Fretwell’s ‘The Sky’s not Falling’. This is possibly the worst book ever written about climate change for any audience, let alone one that is being thrust upon impressionable young minds. It is replete with incorrect ‘Fun Facts!’ and misleading propaganda. For instance, did you know that “the two largest ice sheets today, Antarctica and Greenland, flow over the ocean and are already below sea level. If they were to melt sea level would not rise very much.”? Or that “sea levels twenty thousand years ago were eighty-two feet lower”? Me neither (try 400ft). Luckily though this book fails at all levels. It isn’t a good children’s book – it ranges from the patronising; “Now imagine a new gas tax” to the inappropriately obscure (cherry-picked journal citations in the text, appallingly captioned figures – how many 11 year olds know what Gross Primary Productivity means?) and it’s even worse at the science (the hockey stick came from a computer model, scientists have found a direct connection between cosmic rays and climate!) let alone economics (e.g. We are rich because we pollute, and therefore polluting more will make us richer! Tragedy of the commons anyone?). Fun Fact! Tim Ball and Marc Morano helped with fact-checking. Update: I am reliably informed that there is probably something much better for kids on the horizon: “How We Know What We Know About Our Changing Climate: Scientists and Kids Explore Global Warming” by Lynne Cherry and Gary Braasch (again!). Thank you for the suggestions, Gavin! I always look forward to RC’s book reviews and wish they came more often, but I realize that you all are very busy as it is, so every time you offer this, it is a treat! Merry Christmas, Happy Hanukkah (though I gather that has ended), etc., and all the best for the new year! which appeared in the Boston Review earlier this year, is a very good work. time to sink in. Even the idea of global warming has not sunk in yet. Thanks for the tips. Can you check your link for Braasch’s website? It seems to point to a pop-up filled web search thing. Many thanks. See the chart on page 274 of “Six Degrees” by Mark Lynas. He says we have until 2015 to BEGIN REDUCING our total CO2 output and we have until 2050 to actually reduce our CO2 output by 90%. The curve has to start down by 2015, not we have to think about it by then. Lynas says the peak of our CO2 production has to happen in the next 8 years. Recognizing that these are hard questions, my questions are: Is Lynas right or wrong about these dates? Do we in fact have to hold the CO2 level to 400 parts per million to have a 75% chance of avoiding the positive feedbacks? Are we as good as extinct if the CO2 level gets to 405 parts per million? Nice list. I’m currently reading Storm World, and I’m enjoying it very much. Even though I’m not much of a book person (I prefer articles), it was very interesting to read these brief reviews. Anyway, I just wanted to say that I really appreciate all the work you’ve done for the past years and I hope I’ll have a privilege to use RealClimate as a reliable source of information in climate change issues for years to come. You’re working with Gary Braasch, how funny, small world (I’m from Portland). He’s a great shooter, I’m looking forward to the product of your collaboration. Cheeky to mention my own book, I know, but I think it might be of interest to Realclimate visitors. Carbon Detox (Gaia publications) came out in November and is the first book to explore in detail the reasons why is so hard for us to believe the reality of climate change. Yes, we know about the skeptics, but the problem is much more complex than that. I even explore the reasons that scientists and professional campaigners seem unable to square what they know with what they do. Although written for a mass market I think that there is something of interest in there for anyone who wants to try and find new ways to think about and communicate climate change. And it’s funny too! While I haven’t read it yet (sorry, I’ve been a bit lazy of late), I understand a book called “Global Warming: Understanding the Forecast”, by someone named David Archer has been well received. It must be worth a mention. Holly Fretwell’s ‘The Sky is not Falling’ sounds like it’s 14 weeks and 1 day too early to be a Christmas present. Happy Xmas and best wishes for the new year to all the posters and scientists at RealClimate, every branch of science needs a site like this. Thin ice is a great book. I have been into the field with Gary Braasch searching for the same shot 100 years after the initial shot to document glacier changes. I look forward to his book. After listening to a Kerry Emmanuel talk recently this book will be good. However, you link for him should end with org not com. Anyone at RC interested in reading and reviewing Hot House, by Robert Strom? The book came out in Aug 2007. One nice feature is that it has a chapter on the climates of Mars and Venus. It’s a bit more technical than the typical popular science book, buthas a lot of great images. In line with comment #6 I’d like to know if you would recommend the reports of the IPCC Working Groups (or AR4 in other words). Are they good reading or are they indeed too dull or hard to understand? I guess I should add that I’m more of a layperson when it comes to climate science though I have been following it for a few years now (in big part with the help of you guys at RC). More shameless promotion: “Fighting for Love in the Century of Extinction: How Passion and Politics can Stop Global Warming” (University of Vermont: 2007) is an exploration of the mass-extinction side of climate change, from economic, scientific, and spiritual perspectives– with a foray into political imperatives and progressive era analogies towards the end. Kind words from Bill McKibben, David Orr, and Ross Gelbspan, along with details at http://www.fightingforlove.com. I’d like to promote a book I just read (on a personal level). It’s called The Go-Giver and it’s by Bob Burg and John David Mann its an excellent read and I would recommend it to anyone that loves books! I think I seen a lot of myself in this book that’s why I connected with it really well. It’s a great read over the holidays. Hope you enjoy as much as I did and I hope you give it a go… sorry the PUN was intended! Merry Christmas to all… and have a Happy New Year! The publisher’s push on Amazon for Fretwell’s book is a real laugher. “The Sky’s Not Falling: Why It’s OK To Chill About Global Warming” is for parents sick of seeing their kids indoctrinated by has-been politicians and Hollywood stars. Unlike books written by would-be celebrities without any scientific or economics background, “The Sky’s Not Falling” is everything a book about the environment written for kids should be: fact-filled, apolitical, fun and optimistic about the future of our magnificent, ever-changing planet. In “The Sky’s Not Falling,” author Holly Fretwell, a natural resources management expert, shows kids ages 8 and up that human ingenuity combined with an “enviropreneurial” spirit will lead us to a bright environmental future, not one where people ruin the earth. Parents confronted by Photoshopped pictures of drowning animals and faux “documentaries” will embrace a book that educates rather than manipulates. Holly Fretwell brings real credentials to the debate, giving kids the scoop not just about global warming, but the real-world consequences of the Left’s responses to it. Notice the harsh condemnation of politicians and celebrities with no credentials followed by the claim that Fretwell brings real credentials. Really? It takes almost no research to find out that she has no real credentials in the field and it’s obvious that she doesn’t listen to those who do. Kim Stanley Robinson has written a trilogy about climate change with the titles Forty Signs of Rain, Fifty Degrees Below and Sixty Days and Counting. I can agree with several of the weaknesses found by reviews on Amazon concerning the books but find no fault with the science in them as I understand it. In addition he has an “Amazon Short”, Imagining Abrupt Climate Change: Terraforming Earth. I haven’t read the last and have just started the last novel but certainly don’t regret any of the time I’ve spent reading the series. Re #4, no, its all about probability and risk. If climate sensitivity is high then 400 ppmv could mean 2C temp rise but its more likely that 450 ppmv means 2C which is still some time away and hence we have time. 3C is where it is believed that the real environmental impact will occur although 2C will be damaging to a lot of the world poor. Gavin– Are the model temperature predictions for scenario’s A, B & C in Hansen et al. 1988 tabulated anywhere? I’d like to run some numbers, but digitizing would introduce the equivalent of “measurement” uncertainty in knowing the model numbers, so I’d rather find a place where they are tabulated. I have the actual GISS temperature data, but not the model values. I have a question for anyone who does radiation code. I downloaded the HITRAN database and software once, but I didn’t understand it well enough to be able to use it effectively. How would I use it to determine, say, the average absorption coefficient of carbon dioxide between 4.1 and 4.5 microns? It’s too bad that the one children’s book reviewed sounds more like a fairy tale, than something for kids on climate science. “We are rich because we pollute.”?? What you mean by ‘we’ Keymosabe? The executives at big oil and big coal and big auto may get rich, while the rest of us tread water to keep afloat. This is an important audience and they deserve better. A few weeks ago a relative celebrated his Bar-Mitzvah and the invitation said that he was committed to the effort to stop global warming. So I sent him a copy of Andy Revkin’s book on his trip to the North Pole and a book that came out in 2007 titled “The Down To Earth Guide to Global Warming” by Laurie David(the producer of “An Inconvient Truth”) and Cambria Gordon. It’s a good broad overview on global warming, for (I’m guessing) 9 to 14 year olds, with a few clear explanatory graphs, such as the Keeling curve and a graph showing the lockstep of CO2 concentrations and temperature for the past 650,000 years. It sure beats telling kids that they can get rich by polluting. The book says that ‘The good news is that we still have time to solve (global warming)’.Next year at this time we should be more hopeful about this.Seven down and one to go. Considering the provenance, further comment seems unecessary. He might try printing out the graphic version of that interval on heavy stock, cutting along the dotted line, and weighing the bottom half. Or RC could add a Matlab link to the sidebar, as a Christmas present to us all. We’ve seen it. The instigator is Senator Inhofe, a long-time whore for fossil fuel interests and a raving pseudoscientist on the subject of global warming. The 400 “scientists” he lists include almost all people who are not climatologists and many who have no science credentials to speak of. It’s a campaign-season distraction, nothing more. Senate’s dimmest bulb digs up comments by 400 people he thinks are scientists that in his skewed perception question man-made global warming claims in 2007. Personally, I don’t think RC should touch this–anymore than they touch the ramblings of any other lunatic. Anyone who still thinks Inhoff has any credibility is a hopeless cause anyway. Just followed up a link on ScienceDaily.com to this site (http://www.seas.harvard.edu/matsci/people/aziz/research/electrochem-weathering/electrochem-weathering.html) about a scheme to process the ocean’s water and remove the hydrochloric acid from it by electrolysis and combining the water with silicate minerals and rocks much like natural weathering does but considerably faster. They say only 700 such plants over the world would be sufficient to transform ALL our excess CO2. Hmmm? sounds almost too good to be true doesn’t it..they also mention that it will use electrolysis..that will probably mean using a lot of electricity to achieve that.. unless on-site solar arrays or wind power are enough to convert mega industrial quantities of hydrochloric acid into a slightly alkaline form that is then pumped back into the ocean again. Apparently it’a all quite feasible say the Massachusetts and Pennsylvania scientists. By the way “A VERY MERRY CHRISTMAS” TO ALL THE STAFF AT REAL CLIMATE and to ALL THE CONTRIBUTERS. GREAT SITE AND KEEP UP THE BRILLIANT WORK. Except that, from the file layouts, HITRAN does not list absorption coefficients per se, but line strengths and half-widths. Thus my question. Any introductions available for those who survived undergraduate calculus, physics and thermodynamics -so might like a look at some of the technical innards? My problem -I hated chemistry and forgot it as soon as possible after my last class! Re #32: J, if you don’t mind PDFs, it sounds like raypierre’s book is just what you’re looking for. You can find it by following the Ray Pierrehumbert link on the right. “The Rough Guide to Climate Change, Second Edition”, by Robert Henson, is due out on Jan. 10, 2008. I’ve been reading the first edition, and look forward to the second edition. (30) I’ve mentioned this stuff a couple of times. I’d like to hear from someone knowledgable whether there is any real possibility of practically (i.e. cheaply) removing CO2 from free air by such techniques. I don’t feel qualified to comment on the potential merits. It could be a fossil fuel interests attempt to distract. But perhaps it is a potentially doable intervention? Thomas (35) — Removing carbon dioxide directly from the air by the proposed technique would be expensive. Here is my quick estimate: 1 tonne of CO2 requires about $US 100 in energy costs, i.e., somewhat over 1 MW-hr. The 100 or so plants suggested to capture about 15% of the CO2 would also require the capital intensity of large wastewater treatment plants. I don’t know the cost range, but expensive. Finally, this smacks of geo-eneginering the ocean’s chemistry, frought with unknown (at least to me) risks. Better is using the carbon dioxide to grow plants. Then there are several (relatively) inexpense ways of processing the biomass to permanently sequester either carbon dioxide or else biocoal. I prefer the biocoal strategy because of the low cost of sequestering biocoal in abandoned mines or carbon landfills (about $US 10–15 per tonne) and also because we can be certain that this is both permanent and safe. To estimate the cost of producing biocoal, it is reasonable to assume that it is about the same as the spot price of delivered coal itself, currently around $US 90 for anthracite, less soemthing for the delivery costs. (So even a modest carbon tax on burning coal would cause utilties and other coal-burners to switch to burning biocoal instead.) But the hydrothermal carbonization to make biocoal is exothermic, so there is some industrial heat available. The demonstration plant in The Netherlands produces 75,000 tonnes per year of biocoal from forestry wastes and co-generates 5 MW electricity for the grid. I think we have lots of good science books and documentaries on global warming (tho we can always use more). I’d like to see more movies on it, in all different genres, from many different angles — political thrillers, interpersonal drama, biographies (maybe THIN ICE), comedy, sci-fi, disaster flick, etc. How about romance, as in AMERICAN PRESIDENT (which at least mentions GW). They could incorporate the GW issue from mere mention, to subplot, to major theme. From bits of the science to focusing on solutions — even as background props. Global warming is like the growing elephant in the room that movies are ignoring, even when incorporation of it serves their organic story structure. An example: the remake of the TIME MACHINE (2002); they used the moon fragmenting ??? as their world cataclysm device, when GW would have been much better — both in terms of reality & story-telling art; just as nucelar war was appropriate for the 1960 version. I guess we need another remake of THE TIME MACHINE. Movies have always dealt with the issues of the day — nuclear war (as in ON THE BEACH & many others), racism, pollution (I remember a flick about a monster in a dioxin-laced paper mill lake). But have there been any movies after DAY AFTER TOMORROW with the GW theme or even a mention of GW? (I’m aware of the THE ARRIVAL, WATERWORLD, CATEGORY 6, & CATEGORY 7.) It think SOYLENT GREEN could be remade with mention of how GW is reducing food supplies. I myself am trying to write a screenplay about GW, but I’d much rather professional screenwriters tackle it. I’ve started a yahoo group – Global Warming Screenwriters Group (for novelists, too)at http://movies.groups.yahoo.com/group/gwswg . We have a stalward few novelists/screenwriters at present. I think movies on GW can be as effective as popular science books and documentaries in raising awareness and inspiration to act. That is, they have their place, along side these other media. Thomas (35) — I suggest that the ocean scheme you find interesting needs further research. After reading the article in the link provided, I find they make a reasonable argument for removing some of the carbon dioxide in the manner proposed. Dear RC, I came across this article (23rd december 2007) in the UK Newspaper the Daily telegraph relating to James Inhofe (yes him again) and allegedly 400 scientists (some of them disginguished apparantly) who appear to deny the existance of human made climate change and bring up the usual other suspects, namely the Sun as the problem. the article refers to a body called the “Senate environment and public works committee ” which on further study does indeed seem to exist and have a lot of scientific comment on this subject. The climate science community must lay this to rest once and for all ASAP and respond in kind to this article and people in it. The people in this dossier do seem to be of good calibre and a response is required in kind. HAPPY XMAS RC. This site is amazing. re. the fact-checkers for that last book– Tim Ball is an active climate-change ‘skeptic’ in Canada– and litigious, too. A colleague here in Lethbridge was sued by Dr. Ball, after my colleague published a letter to the editor in the Calgary Herald, questioning some aspects of Dr. Ball’s scientific record as reported in a newspaper article–my colleague’s evidence came from Dr. Ball’s own online C.V. and public information on the careers of some Canadian climatologists. But that didn’t stop Ball from suing…a sad commentary on the state of the debate and climate change skeptics’ frame of mind. Click on “Rabett Run” in the Real Climate sidebar. Follow Eli’s links and you will see that the blogoshpere is rapidly shredding the credibility of the “400”. I totally agree with you that Real Climate is an amazing web site. The scientists here do not need to spend their valuable time addressing Inhofe’s drivel. My best to the scientists contributing and to the talented lay folks trying to educate a seemingly endless parade of the skeptical, the confused and the deliberately obtuse. The reports from the AGU were some of the best real time science reporting I have ever read. Horse puckey. What you have there is the work of one individual–Senator James Inhofe. His “scientists” either are not scientists, are not climate scientists, are not active climate scientists or are simply contrarians. If the world together is going to tacke climate change with 100% effort we cannot afford to have skeptics and denyalists muddying the waters with the effect of diminishing that required 100% effort. As I mentioned in the past.. what if there is a 0.0001% chance thant ALL the world’s top climate scientists are wrong and anthopogenic CC is a just a huge red herring, I’m sure ALL those climate scientists could live with red embarrassed faces for a while…BUT what, just what if they happen to be right and we have wasted another 10 years arguing and bickering over the urgency of the problem or if we have a problem in the first place and the world then falls well short of the required 100% required effort. By then all the summer artic ice has gone, the world experiences cat5 hurricanes like they were going out of fashion, world food crop begin to get wiped out. I know very well what I would like to do with all the red faces of the denyalists..unfortunately I’m not allowed to print it here…. for they would have robbed my 2 year old son of a future and your children as well…think about it!! OUR contrived logic, linear thinking, material obsessiveness and mechanistic world view, that we see pervading the predominant culture on Earth in OUR time, could result in the children following OUR EXAMPLE and recklessly charging down a “primrose path” to be confronted by a colossal ecologic or economic wreckage, the likes of which only Ozymandias has seen. Re #20 (Jim S.) I’ve just finished “Sixty Days and Counting”. I have mixed feelings about the series, though I’m sure I’ll read the next instalment (I think I could even tell you some of what will happen). I think Robinson sometimes spices up the science a bit in the interests of the story (e.g. in “Fifty Degrees Below”, which by context is set in 2012, 2016 or possibly 2020, he stops the Gulf Stream south-west of Ireland), but I don’t know of anyone else who’s had the courage to tackle the issue in hard SF. The storylines are strong, but the characters, to me at least, less interesting and sympathetic than I think he thinks they are. It’s very much US and even Washington DC centered, but an interesting picture of the science/policy interface emerges. Lawrence, We will never achieve anything like unanimity. The most we can hope to do is marginalize the anti-scientific, greedy and irresponsible. I’ve found that the most effective way to do this is let them spout their vitriol and lies. By all means, we should respond to any credible threat, but Inhoff is not even taken seriously within his own party. He, a certain English Aristocrat and certain other nutjobs do us a favor when they oppose us. The most effective approach I have found is to try to convince those who are skeptical for political reasons that all they are doing by opposing good science is yielding their place at the negotiating table to their political opponents. After all, if Al Gore had not been crying out in the wilderness–if even one conservative has stood up with him–he never would have won an Oscar of a Nobel Peace Prize. Shed the credibility of all 400? Pete, have you looked at the list. Most are not even climate scientists. And even those who might have a modicum of knowledge of climate are not actively publishing in the field. As such, there is no credibility to shred. Hell, a decade ago, they were claiming 30000 scientists opposing the consensus. Now we’re down to 400. It is unfortunate that the majority of people do not have sufficient understanding of the science that they can draw their own conclusions. For them, it comes down to argument by authority, so we have to look at the quality of the people and organizations on each side. OK, some Americans associate anything having to do with the UN with black helicopters–but the National Academies? The American Physical Society. In fact every professional society that has weighed in on the subject (even the American Association of Petroleum Geologists is now neutral). All people do by opposing the science at this point is establish that they don’t understand science.